Destiny Quest engages students in a visually appealing and highly graphic online searching experience to help them easily locate and identify appropriate resources within the library catalog of their local school. With Destiny Quest, students can see the top ten books and new arrival titles highlighted on the homepage, search the library collection, browse the scrolling carousel of bookshelves, view book covers, and link to title details from any computer with an Internet connection. They can refine their search results by author, subject, series and more, and find the best titles for their interests or reading levels. Discover Education Streaming integrates seamlessly into any curriculum with over 100,000 of the newest learning objects and videos tied directly to state and national standards. 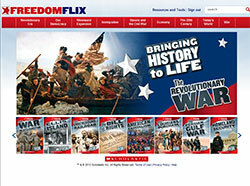 Featuring dynamic e-books of the Children's Press best-selling Cornerstones of Freedom series that include embedded popup features such as maps, timelines, virtual tour clips, primary source videos and audio clips, history comes to life with FreedomFlix! This resource will help students hone literacy skills, build knowledge of important historical topics, and cultivate 21st Century Skills through the inquiry process. And, FreedomFlix aligns to the Common Core Standards by featuring multiple text types and a cross-curricular, nonfiction focus. Gale, part of Cengage Learning, has e-research and educational publishing resource databases of all kinds. Gale has wonderful reference content as well as full-text magazine and newspaper articles, maintaining more than 600 databases that are published online, in print, as eBooks and in microform. GoNoodle is an international video program that helps channel students’ energy in a positive way to stimulate learning. In this program, students participate in short “brain breaks” where they are able to get moving in their classrooms while still learning and developing skills. This program is being used in 52 of our schools by over 75% of our eligible teachers. GoNoodle is present in our schools thanks to a partnership with the CHRISTUS St. Patrick Foundation’s Children’s Miracle Network. 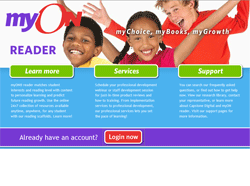 myON reader personalizes reading for students by recommending books based on student interests and reading level. It also tracks book usage and reading growth over time and can predict future reading growth. 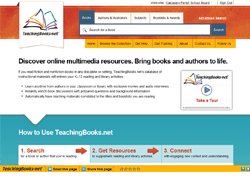 Use the online collection of resources available anytime, anywhere, for any student. ScienceFlix combines curriculum-driven, leveled content, interactive features, and intuitive navigation into a single, highly-engaging digital resource for students in grades 4 through 9. 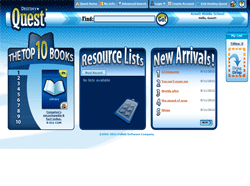 TeachingBooks.net is a licensed online database that can be used to explore children's books and young adult literature and their authors. The database provides access to educational materials and programs (short movies, audio book readings, book discussion guides, and more) that add a multimedia dimension to reading in the classroom, library, and home. 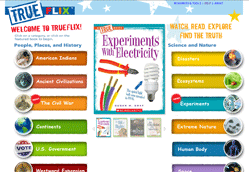 Scholastic TrueFlix is an online Whiteboard resource focusing on engaging science and social studies content for students spanning grades 3-5. TrueFlix is an online resource that uses True Books content to help students hone literacy skills, build knowledge of subject-area content, and cultivate 21st Century skills through the inquiry process. It is also a perfect Whiteboard resource with its collection of introductory videos and media types, leveled texts, voice-over reading features, and soft assessments. The TP is a collection of TumbleBooks (animated, talking picture books) with fiction, non-fiction and foreign language titles, Math Stories, Read-Alongs (chapter books with sentence highlighting and narration but no animation), Videos (from National Geographics), TumbleTV which consists of pre-set playlists of a sequence of books and Tumble Puzzles & Games. TumbleBooks are created from existing picture books which we have licensed from children's book publishers and converted to the TumbleBook format. 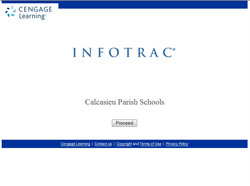 World Book Online in Calcasieu Parish features content and tools developed for various grade levels and ages: World Book for Kids, World Book Student, and World Book Advanced. It’s also available in Spanish and French. 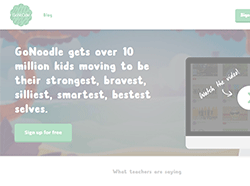 Each site offers simple navigation, easy-to-read articles, multimedia, comparison tools, interactive games and activities, and teacher resources. It includes the articles of the World Book Encyclopedia, a Biography Center, dictionary, atlas, an extensive multimedia collection, thousands of editor-selected Web sites, correlations to curriculum standards, and much more.